People line up outside a fallout shelter Estero, Fla., Saturday, Sept. 9, 2017. Image via the AP. “You cannot survive this,” he added on CBS yesterday. But many have little or no choice but to stay. 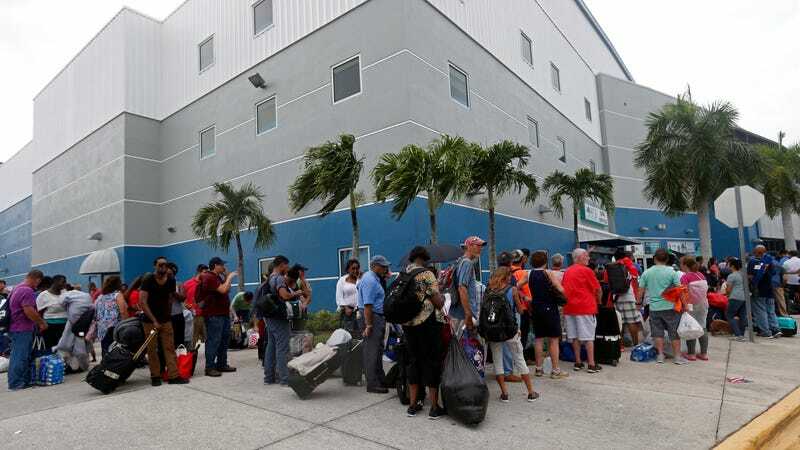 Low-wage workers risk losing their jobs if they evacuate, and those living below the poverty line don’t have the means to leave (let alone eat, NPR reports). Some like Lexi Allen, also a woman in her twenties, waited til yesterday afternoon to flee from Sarasota. She described the chaos on Twitter: no gas for days, not even emergency back-up supplies. She says directions constantly change and says people are confused by last-minute orders from the government. She reports that instead privately-run businesses like hotels are taking responsibility for sheltering people. She is currently on the road in Georgia looking for a hotel which takes pets. She hasn’t seen images of her house yet, but she knows that it’s one of the million homes and businesses where the power is already down. Earlier in the week she’d called seven roofers, all of whom were busy, and even by Tuesday three local Publix and a Target had already run out of water and batteries. Because of this, many had already made preparations and didn’t want to risk getting on the road. “Some just weren’t ready to leave and had already prepared to hunker down and stayed with that decision,” Donglasan said of her friends, many of whom also lacked the resources to get a car and a hotel. Their lights are now flickering, she says. Donglasan was able to get through to a friend Michaela Stockhill, who’s stuck because of pets; on top of her own cat, she had to take care her mother’s four dogs when her flight was cancelled, as well as her sister’s cat because her sister is a nurse now assigned to a three-day ER shift.